With the wind in the right direction the curtains can move in the draught let in by the closed windows, there is no double glazing and daylight can be seen around the front door. This house is draughty. 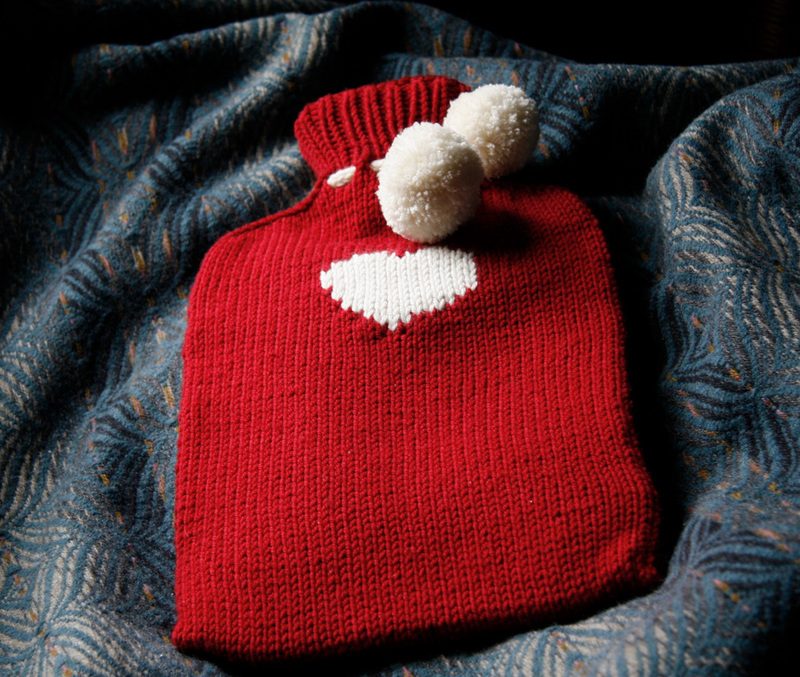 Hot water bottles are essential not just at night but when you’re on the sofa or typing at the computer. 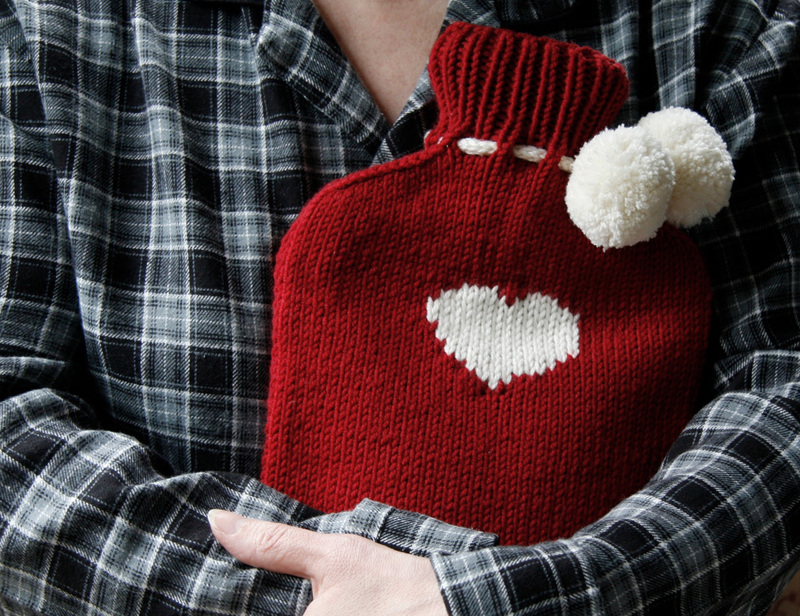 And every hot water bottle needs to be clad in its own woolly cover. Here’s one with a heart for when romance is dead and all you get is complaints about cold feet. ssk: slip, slip, knit. Slip the next 2 stitches, knit wise, one at a time, return to left hand needle in their new orientation and knit together through the back of the loops. With 3.75 mm needles cast on 43 sts. Row 1 (RS): K1, *P1, K1; repeat from * Repeat row for 6 rows in total. Repeat until work measures 21 cm ending with RS facing for next row. Row 2 (WS): P2, p2tog, purl until 4 sts rem at end of row, p2tog tbl, p2. 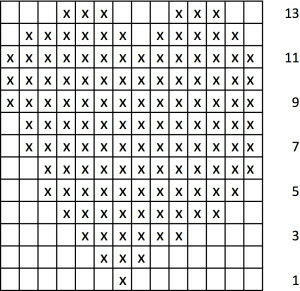 Decrease as set on every row until 19 sts remain. Place sts on a holder or scrap yarn. RS row: Knit in stocking stitch until work measures 31 cm ending in a WS row. Row 2 (WS): P2, p2tog, purl until the last 4 sts, p2tog tbl, p2. Repeat decreasing rows until19 sts remain. The back should measure 21 cm at its widest and 30.5 cm long. The front should measure 21 cm at its widest and 41 cm long. From the neck downwards, seam the sides of the cover using mattress stitch, stopping 3cm from the back ribbing. Do not sew in ends. Transfer live front stitches to a double pointed needle and the back stitches to another needle. Divide the work between three needles as follows. K 12 sts of front on to 1 needle, k rem 6 sts of front and 6 sts of back on to second needle, k rem 12 sts on to a third needle. Join to work in the round. Row 1: *K2 tog, yo; rep from * the last yo will be between the last stitch of the round and the first st of the next round. Place marker. 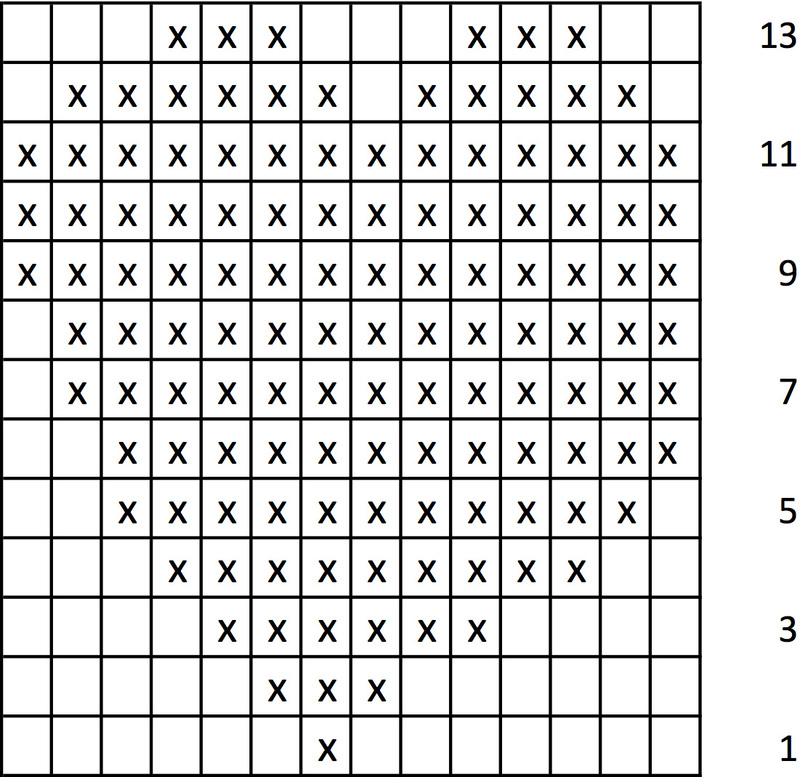 Row 2: *K1, p1; repeat until end of round. Repeat row 2 until ribbing measures 6 cm. Fold the ribbed end of the front of the cover towards the back so that it is under the ribbing of the back of the cover, to make an envelope. Finish sewing the side seams catching in all three layers. Sew in loose ends. Using double pointed needles cast on 3 sts leaving a tail end of 30cm. Row 1: Knit 1 row. Do not turn work. Repeat row 2 giving the end a gentle tug occasionally to set the stitches. Knit 26 cm. Thread the long end of yarn on to the darning needle and feed the icord through the eyelets to check that is long enough. If it is cast off but make sure you leave a long tail again. Attach the pompoms to the end of the icord but make sure the icord is threaded through the eyelets first!